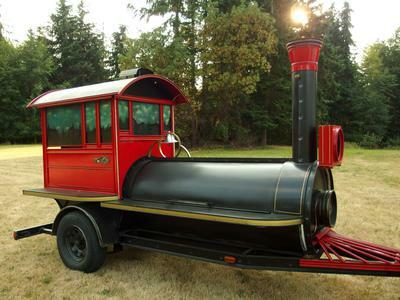 Rent the ”BBQ Train” for your next event. It is a unique 14’ towable trailer for grilling and smoking of all kinds of meats, fish and vegetables. It is equipped with lights, bells and a wireless sound system to insure a crowd. I will deliver and pick-up the unit at your location and answer any questions you may have. We also have pots, pans, cambro’s (insulated units for cool or hot items) and utensils for rent. I can provide a grillmaster if you like. Call Paul Howard at 425 330-3501.